He’s the player who sums up Burnley’s revival over the second half of the season. So it was fitting that midfielder Ashley Westwood was slap, bang at the centre of the Clarets’ best performance of the campaign on Saturday. Relatively unheralded, the former Crewe and Aston Villa man has become the fulcrum of Sean Dyche’s side as Burnley have stared the significant threat of relegation in the face, only to re-emerge with a remarkable run of form which could effectively see them secure safety on Saturday with four games to spare. In a season where Burnley have been shorn of the class of Steven Defour for effectively most of the term, Westwood has made himself one of the first names on the team sheet, more than filling the void left by Joey Barton two years ago. 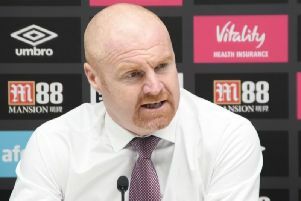 He has displayed the facets that Dyche looks for in his side, the legs, hearts and minds, and ability to effect the game with and without the ball. When Burnley lost at Newcastle in February, with Westwood having fallen ill, his absence appeared to destabilise the entire side, in a poor team display. But he has since slotted straight back in, and got on with his job with the minimum of fuss. One sequence late in the game said everything. After breaking up play for the umpteenth time, with no one in a white shirt ahead of him, Westwood flipped the ball out to a safe area out wide, and then immediately began to hunt it down again, before then taking an almighty blow to the head from a Josh King rocket. After shaking himself down, and getting a friendly pat on the head from skipper Tom Heaton, he was off blocking Bournemouth right back Adam Smith on the edge of the box, and showing his competitive nature with a verbal volley for the former Spurs man as he lay on the turf. I don’t give out marks out of 10, but Westwood would be fairly close to full marks for his efforts at the Vitality Stadium, after another performance underlining his growing worth. Westwood ended the day with another assist, and a first goal in open play for three years. He is now eighth-equal in the Premier League for assists with seven, bettered only by Eden Hazard, Christian Eriksen, Bournemouth’s Ryan Fraser - peripheral here, Paul Pogba, Andrew Robertson, Leroy Sane and Raheem Sterling. While Westwood’s stats are among the best in the division, Burnley’s form is also up there. This victory made it 24 points from 14 games, more than Spurs and Chelsea over the second half of the campaign, with five games still to play. A win at home to Cardiff on Saturday would see them 11 clear of danger with Cardiff having 15 to play for, and an inferior goal difference. From Boxing Day’s 5-1 home defeat to Everton, when Burnley sat in the bottom three with only 12 points at halfway, it is a stunning revival. Here, Burnley looked every bit as impressive as their last visit to the Vitality Stadium, when the side sat seventh in the table and the away end’s ironic chants of going on a European tour began to grow in belief. That win, in November 2017, was the last time a side outside the established big six had won here, and the Clarets again made it look easy in a comfortable, controlled display. It was more impressive as they had the shock of conceding an own goal within four minutes, but for the fifth time in just over a year, they came from behind to win in the Premier League. Ashley Barnes was unfortunate to guide a header past Tom Heaton under pressure from Nathan Ake, after Jefferson Lerma flicked on a Fraser free kick. But Barnes and strike partner Chris Wood would have a major bearing on the rest of the game. Bournemouth centre backs Ake and Chris Mepham couldn’t live with the duo’s physicality and aerial threat, and Wood headed in the leveller from a Westwood corner, before Westwood put Burnley ahead with an emphatic finish seconds later after Mepham failed to clear convincingly from a Dwight McNeil centre. McNeil also caught the eye, as Liverpool loanee Nathaniel Clyne suffered the indignity of being replaced at half-time. He had given the Reds’ first choice right back Trent Alexander-Arnold an uncomfortable afternoon at Anfield last month, and the man Alexander-Arnold displaces at Liverpool had no answer for the Cherries. He was taken off, before he was sent off. After the break, the excellent Charlie Taylor did well to keep the ball in down the left and find Wood, who held the ball up well for Barnes to net a killer third, sparking joyous celebrations from the travelling support, who can breathe somewhat easier and look forward to a fourth-successive year in the top flight with a level of confidence, rather than hope.